More than 500 students across the country participated in the National Chidon Ha’Tanach this year. 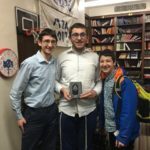 Included among them are MTA Sophomores Shua Pariser and DJ Wartelsky and Junior Micho’el Shloush, who will all advance to the National Finals. In order to achieve this accomplishment, the talmidim studied the entire Sefer Bereishis, 15 perakim of Sefer Yehoshua, 6 perakim of Sefer Yechezkel, and 16 perakim of Tehillim. Congratulations to the Chidon Team! We wish them continued success on their road to the National Finals.